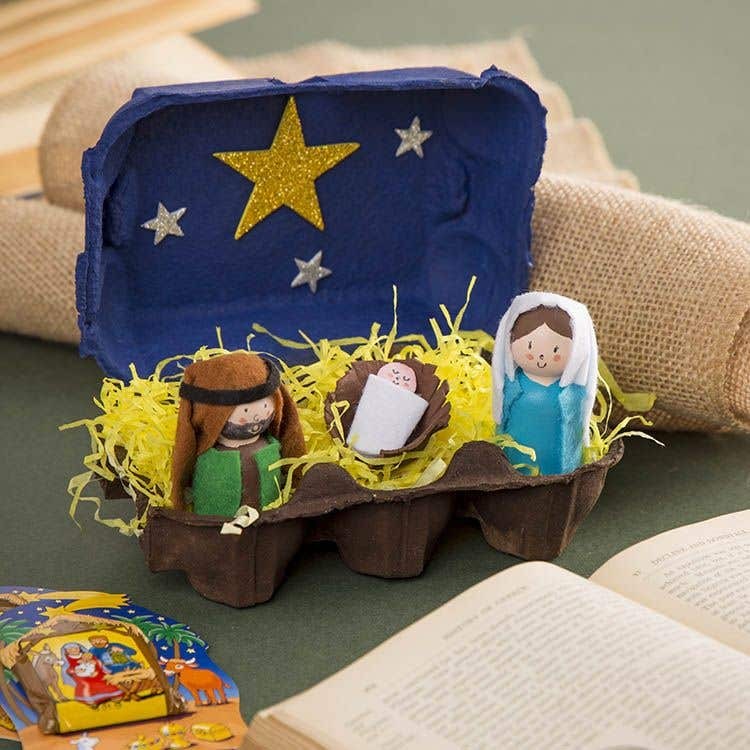 Transform an empty egg-box into a Nativity Scene with Mary, Joseph and baby Jesus. Cut the pointy cone shapes out of the middle of one of the empty egg box. 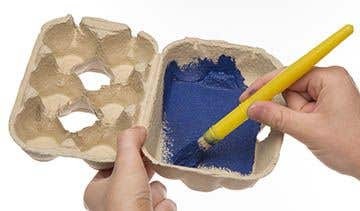 Paint the inside and outside of the lid of the egg carton a dark blue for the night sky. Leave to dry. Paint the inside and outside of the base of the egg carton dark brown. Leave to dry. Take 2 wooden people. Mix a skin tone colour and paint the faces of the two wooden people. Leave to dry. 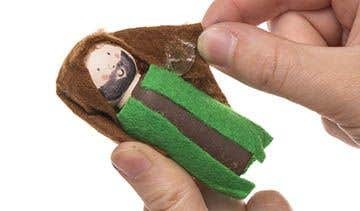 Paint a beard onto one of the doll’s for Joseph and paint the body brown. Paint the other wooden doll’s body blue for Mary. Leave to dry. Cut 2 rectangle shapes 7cm X 4.5cm one from the light blue self-adhesive felt and one from the green self-adhesive felt. Peel off the backing and stick the blue felt lengthways around the Mary’s body starting from the back and the same for Joseph with the green felt. Cut 2 rectangle shapes 6.5cm X 7cm one from white felt for Mary’s headdress and one from brown felt for Joseph’s. Stick the white headdress lengthways on the top of Mary’s head and stick down using craft glue dots. Fold the back down and stick in place using glue dots. Do the same with the brown headdress on Joseph’s head. Cut a thin strip roughly 8cm long from black self-adhesive felt to wrap around Joseph’s headdress. Draw on Mary and Joseph’s faces with a black thin pen. Take the other egg carton and cut out one of the egg dimples. Snip around the edges using scissors, trim down and bend the cut edges outwards to make a crib for baby Jesus. Paint the crib a dark brown. Leave to dry. Cut a small circle from a piece of egg carton for the baby Jesus’ head. Paint the circle a skin tone colour and leave to dry. Draw on baby Jesus’ face with a thin black pen. Cut a small rectangle roughly 6.5cmcm X 7cm from white self-adhesive felt. Wrap baby Jesus’ head in one end and wrap the felt around it like a blanket. Hold and pinch in place to stick the felt together. 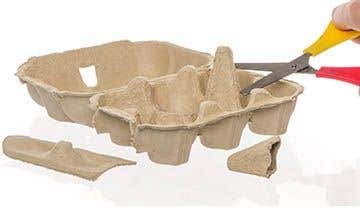 Fill the brown base of the egg carton with yellow shredded tissue paper for straw in the stable. Place baby Jesus inside the crib and place in the middle. Place Mary and Joseph either side of the baby Jesus where they can balance. Stick one large gold glitter star sticker in the middle of the egg carton lid. Decorate the rest of the night sky with smaller silver glitter star stickers. Instead of the self-adhesive felt sheets, you could use plain felt sheets and affix in place with craft glue dots.